So there's been a slight change in plans, I decided it'd be better to focus on replacing this than submitting another new sheet. The one currently on-site was very hastily put together by a highly inexperienced E. Gadd Industries, and now that I've listened to the actual original, I realize that the current on-site sheet has some parts out of order. So uh... yeah. This one is accurate. -I'm hearing the bass at the end of bar 13 as two semiquavers D and then the octave below D (rather than just a quaver D). Like the same motion of the bass in bar 10. -Not sure about the D in the second triplet in the first bar. I think it might be a C instead, but not 100% certain. 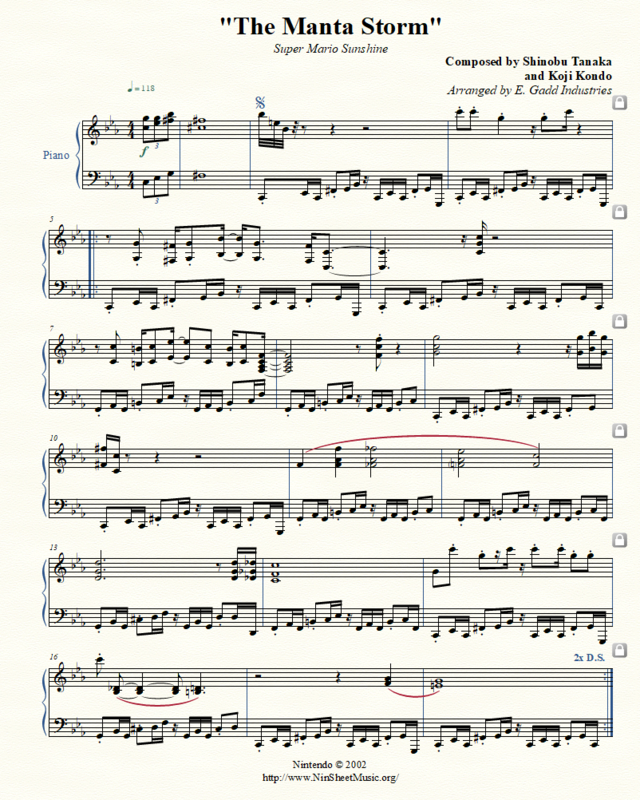 Also I'd remove the lower octave in the RH here since it's so fast. -First note of the right hand in bar 3: a F# rather than a Bb? Once again, not 100% certain as it's really hard to make out. -Since I assume we don't want pedal in bar 15 you should cut the semibreve in the right hand short (or just omit it). -The repeats as it stands is a little confusing and I think there's a nicer way to write it. Just have a standard repeat section from bar 5 to bar 18 with a D.S. second time marking at the end of bar 18. Then stick the sign at bar 3. This would cut bars 19-20 out of the sheet entirely. -I'm hearing the bass at the end of bar 13 as two semiquavers D and then the octave below D (rather than just a quaver D). Like the same motion of the bass in bar 10. I think I got this? -The repeats as it stands is a little confusing and I think there's a nicer way to write it. Just have a standard repeat section from bar 5 to bar 18 with a D.S. second time marking at the end of bar 18. Then stick the sign at bar 3. This would cut bars 19-20 out of the sheet entirely. I think I did this as intended? Not entirely sure, but the repeats here are weird regardless. That said, playback doesn't exactly seem to want to cooperate for the last repeat, but that's more a YouTube issue than a NinSheetMusic issue. Good work! Thanks, and thanks for reviewing! EDIT: I also noticed I'd originally misspelled Koji Kondo's name wrong, so now it doesn't do that. (I can't really take credit for this, Latios came up with it haha.) It also means the whole sheet fits nicely onto one page. -Flip the RH notes in the first bar downwards as they should be normally. -Perhaps add a double barline at the sign? Edit: Here's a file with everything except the double barline. I updated the files, including the double barline. Also, a staff resize, nice. Reset the articulations and updated the files. This submission has been accepted by Static.